Hi friends! I leave tomorrow for my vacation to the cities, so there won't be posts on Friday or Monday, but I'll be back in a week with tales of adventure and hopefully a nice pile of bus knitting. 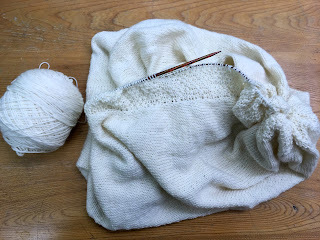 I've been keeping on with the first sleeve on Chaverim, and it's going more quickly than I anticipated, which is always refreshing. I'm almost to the bit where it gets really fun, so that will be waiting for me when I get back. As will a new ball winder, hopefully- I ordered it yesterday, and hopefully it will be smooth sailing from here on out and I'll have a pattern ready for you all in April. I'm still in the middle of Pandemic, but I decided to bring a few poetry books on vacation with me- firstly, because they're a bit lighter and easier to carry than a hardcover, and secondly because I have more than a couple dozen poetry books out from the library right now and I need to get some returned. Someday I'll learn how to show restraint in the library, but apparently it's not going to be any time soon. I hope you all had a wonderful weekend! Mine was very busy- I almost feel like I need another one! Fortunately, I have a short week this week because I'll be visiting my friends in the cities, and I'm really looking forward to that. I finished the collar of my Chaverim on Friday night, and realized that I hadn't calculated the sleeves yet, so I ended up leaving it home on Saturday and bringing along a couple of other projects to work on in the car and during the show choir showcase. It was a nice break, and I'm hoping to get this sleeve half done before I leave in a few days. 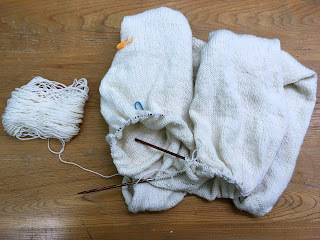 I'm going to need to wind one more skein of this yarn to finish the sleeves, but that will have to wait for now. Sadly, I dropped a picture frame on my ball winder a few days ago and broke it, and I think it's not repairable, so I have to order a new one. I'm hoping it will be waiting for me when I get back from my vacation and I can get back to work. 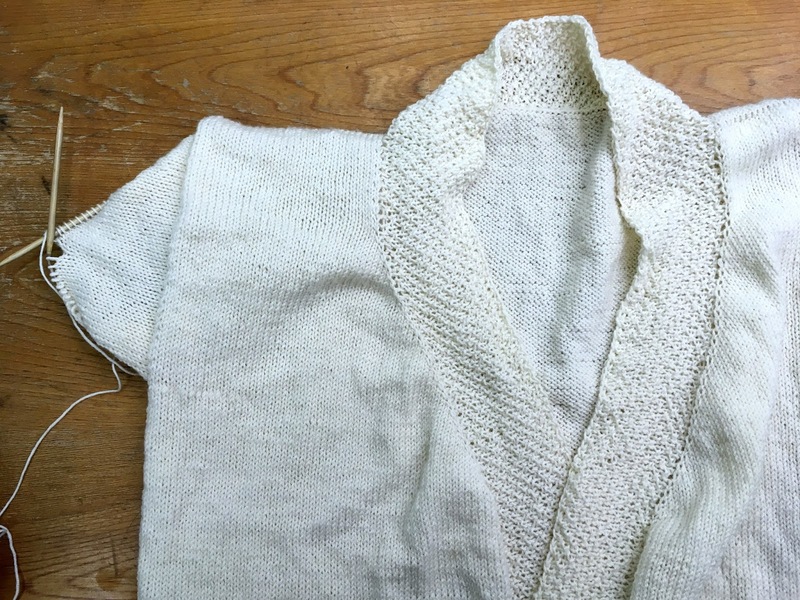 It's a good thing that the collar only needs five more rounds, because I'm running out of ways to photograph a white blob, and I'm sure you're all sick of looking at it. 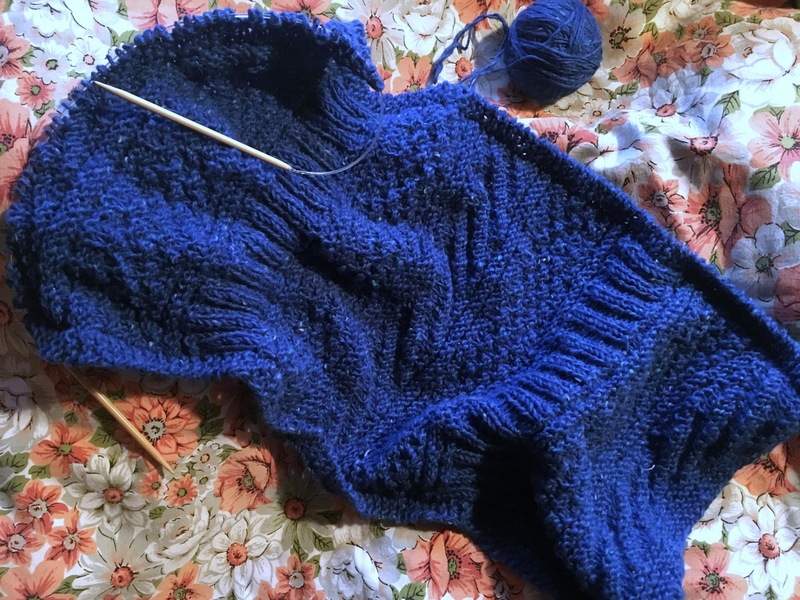 The good news is, I have a real, honest-to-goodness FO to share on Friday, and I'll have tons of knitting time this weekend, so hopefully the next time you see Chaverim it'll be looking pretty different. I'm still trucking along on the tidying front, and it's really starting to wear on me. My room looks like a herd of cocaine-fueled rock-star-wannabe frat boys went on a rampage. But at least my closet is somewhat organized. I'm also using this cleaning bender as an opportunity to check my stash for wee beasties, which probably wasn't the best idea. I'm still reading Pandemic, but I've got some poetry books lined up for car reading this weekend too. I have way too many library books checked out right now, and I really ought to get some finished and returned. I'm hoping that Sunday can be a lazy day and I can get some reading done, but there's just too many books and not enough hours in the day! Well, my Chaverim sample is looking a bit different, isn't it? 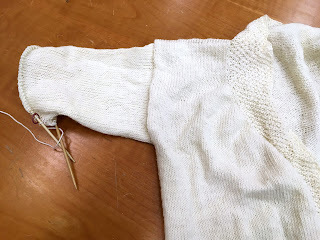 I finished the body Friday evening, and picked up stitches all around for the collar. I'm a little more than halfway through the collar now, and hopefully I'll get the first sleeve started in a couple days. This next weekend is a show choir weekend, so I'll have eight hours in the car and several more hours in an auditorium to crank out some serious sleeve action. I didn't quite manage to get everything done I'd hoped to this weekend, but I caught up on six loads of laundry, reorganized my bookshelves, organized my fabric stash, and made coffeecake without over-baking it, so I'm calling the weekend a success. I still have a bunch of tidying and cleaning to do, but I'm hoping to get short bursts done over the next couple of weeks. My goal is to have my space totally clean and organized and reset and ready to go before the spring cleaning bug hits, so then I can focus on other things around the house. 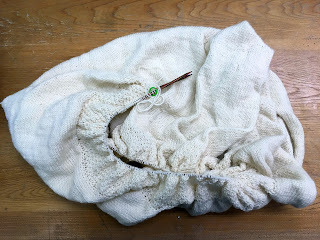 My Chaverim sample is coming along nicely- I've got ten more stockinette body rows, then I'll pick up stitches all around to do the bottom hem and neckbands in the round. Then it's on to sleevesville. I'm getting a little nervous about finishing before my arbitrary self-imposed deadline- I'm leaving to see my friends in just under two weeks, and I'm still on the body- but whatever I manage to finish before I go won't be waiting for me when I get back, so it's not like there's much at stake here. This weekend's going to be a nice relaxing one- the next month gets kind of crazy, so I'm looking forward to doing some tidying and some baking and lots of knitting. I also started a new book this week that I'd like to finish- Pandemic, by Sonia Shah. I'd been trying to read a novel for the past few weeks and finally made it a third of the way through before realizing that I wasn't ever going to get invested or interested in it enough to make it through the next 400 pages. It's been a while since I've had to quit a book like that, but I'm zooming through this one- it's equal parts interesting and terrifying, and right up my alley. If I'm really clever and responsible, I'll take the time to pound out a first draft of this pattern this weekend. If I don't get a draft out before I leave this to go visit my friends for a few days, it'll be so much harder to get the pattern writing gears cranking when I get back. Also, like I said, the next month's worth of weekends gets pretty busy, so if I don't do it now, I don't know when I'll get the chance to sit down and get this part done. Happy International Women's Day to all of the magnificent, hardworking, passionate women out there! Today I decided to give a shout out to some of my favorite women around the knitting blog circuit-our community has so many incredible women in it (especially since this is such a women-heavy industry) and I definitely don't give everyone the number of shout outs they deserve! Brandy @ brandyvdesigns.com- What's not to love? 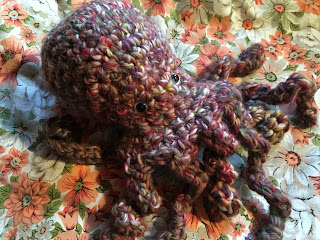 She designs gorgeous, gorgeous things, dyes incredible, playful yarns, and is a doctor (not that kind of doctor)! 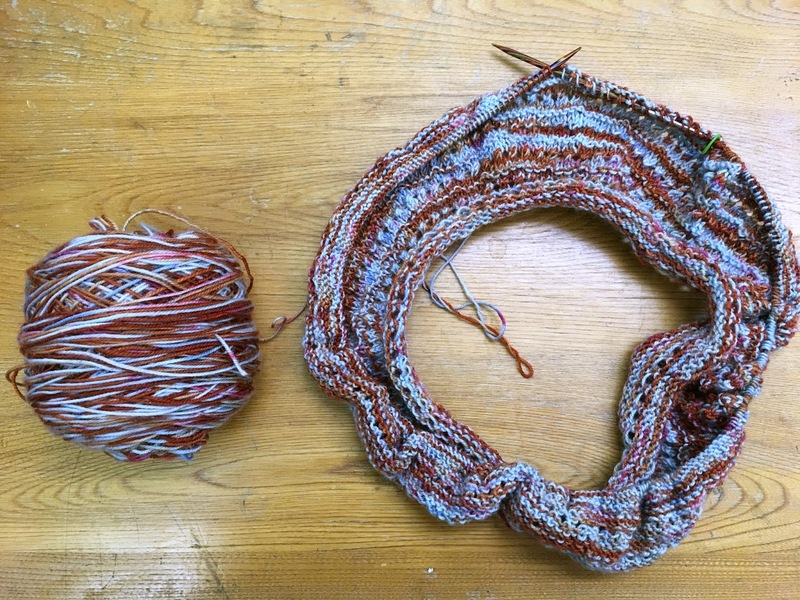 She even started the dyeing part of her business, Long Dog Yarns, while she was in the final stages of her PhD! I mean, if I had a tenth of the drive and time-management ability Brandy does, I can't even imagine. Leah @ rubysubmarine.blogspot.com- Leah is a fantastic designer-some of my favorite finished objects come from her patterns-and she also has the distinct honor of writing the only crochet pattern that doesn't make me swear up a storm. 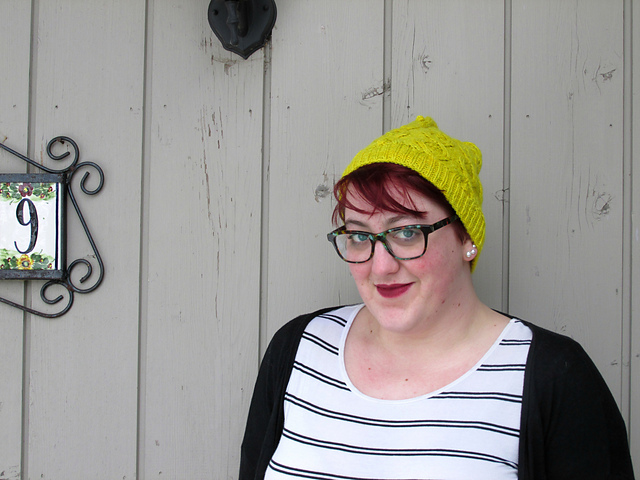 Teresa @ canaryknits.com- Teresa is Leah's partner in crime the Great Northern book, and she's a fierce designer as well. She is a crop top queen, and she's spending this year reseraching and analyzing sizing standards as part of her Knit Petite Project to help all knitters figure out their fit pitfalls and make garments that accomodate their bodies. Cory @ blog.indieknits.com- Cory is one of the best pattern writers I've ever come across, and she is a genius at bringing dozens of sources of inspiration together into one carefully edited pattern. She also really knows how to have fun with clothes and fashion, and it was her blog that encouraged me to explore my own love of style and fashion more. Heather @ thingsimakeplusrocks.blogspot.com- When I first met Heather in the blogosphere, she was a geologist, sewer, knitter, crocheter, and all around badass. Now she's all those things and she owns a yarn store. I don't know how she finds enough hours in the day to run a successful brick and mortar shop and sew and craft, but she does, and seeing a new post pop up or getting a message from her always puts a smile on my face. Joan of Dark @ joanofdark.com- Joan was one of the first online knitters I ran into back in college, and she's a constant source of inspiration. She's funny, she's smart, she has amazing adorable animals, she runs a coffee shop, does roller derby and aerial lyra, and still finds time to write knitting books! 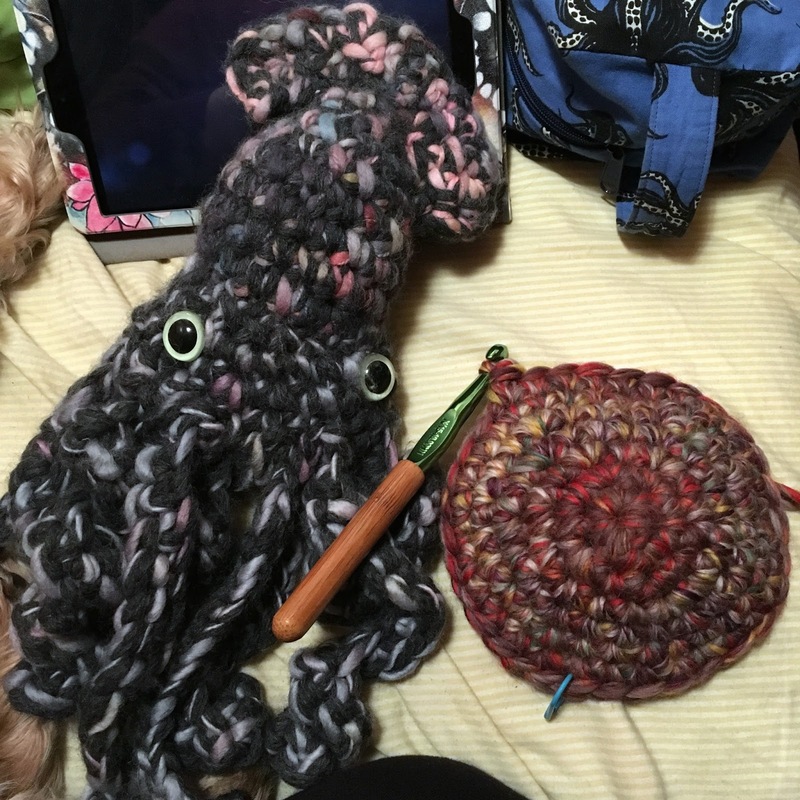 Her blog and patterns really inspired me to be creative and have fun with knitting, and her general outlook on life constantly motivates me to try new things and find the things I'm really passionate about. Holly @ sillylittlelady.wordpress.com- Holly has been my tech editor for two years now, and every day I'm thankful for her. She is better at math than I could ever hope to be, on top of just being one of the nicest people I know and an amazing designer. She's also got a crasy amount of drive-on top of designing and tech editing, she's also a realtor and avid rock climber, and her adventures always make me want to pack up and hike through a national park for a week or two. I hope you all have a fantastic International Women's Day, and that you all have a chance to appreciate and thank some of the fantastic women in your life! 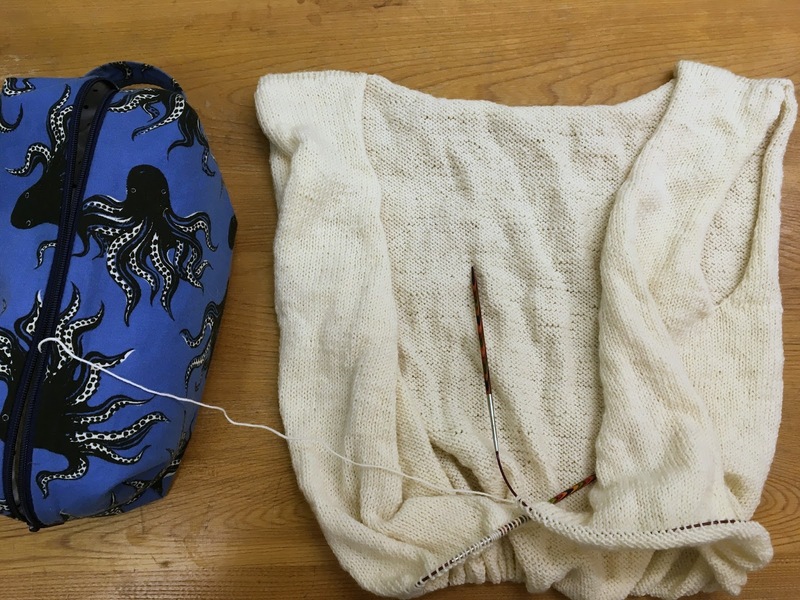 Yup, the sweater body is growing. I'm somewhere in the neighborhood of nine inches past the underarm, out of eighteen total, and I'm trying to keep my momentum up. I definitely needed my little crochet break this weekend, and as soon as I get eyes for him (or her), my new octopus friend will make their blog debut. Anemone's birthday was this weekend, so I got to make a spectacular series of kitchen disasters in preparation of her birthday brunch. You know in paper towel commercials, when people don't put the lid on the mixer and stuff flies everywhere? Yeah, I did that. Flour, sugar, eggs, and butter everywhere. I was still finding spots a day later. And then I made a repeat performance the next morning while making the frosting. Powdered sugar everywhere. But it was good to see Anemone, and we had delicious brunch and cakes, so it was all worth it. To round off the weekend, yesterday evening my mum and I made strawberry jam and I managed to not splash and burn myself horrifically, so that's nice. Although I did drop a cookie sheet on my foot and bruised it, but that's way more preferable to burning your skin off with boiling sugar, so I'll take it. Happy March! I have a new pattern out today, and I'm really thrilled with it. Brizo is all about keeping the ocean sun and wind in the coldest, greyest days of winter. Large gauge seashell lace plays up the spirit of the beach while super bulky yarn keeps the winter chill at bay. Drape it once or wrap it twice, Brizo's got your back until beach weather returns. I have such a love for large gauge lace-to me it's just the right mixture of pretty and funky, traditional and trendy. We all need a little brightness and cheer in the middle of winter, and a great beachy (but cozy!) cowl has been just the ticket for me. Brizo is worked flat and grafted, and the lace pattern is both charted and written out. It's available in my Ravelry Store now. 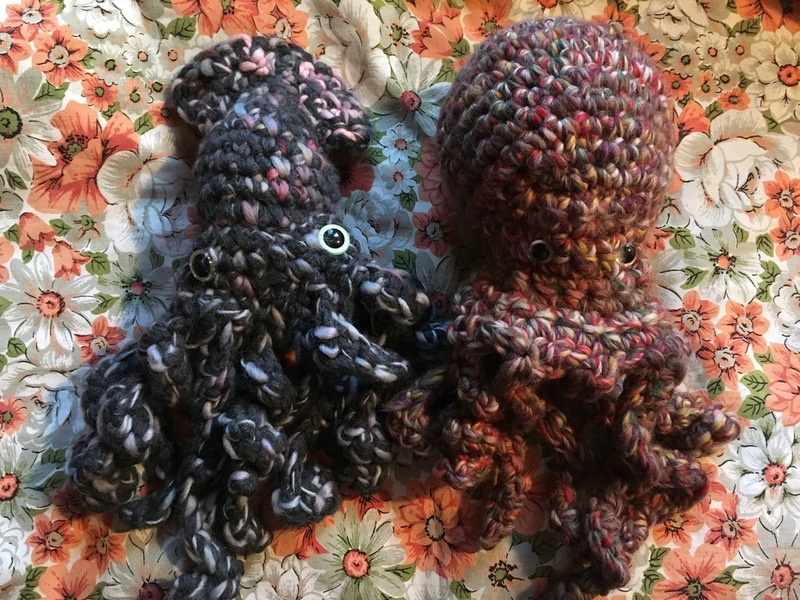 Also, since it's Malabrigo March, all my patterns are 25% off with the code "malmarch17" The code is good all month long, and it works on all my individual patterns (including Brizo!) as well as the ebook for Granite.